Listed in one of my favourite guide books* as a romantic London destination, the next stop on my second annual Books are my Bag bookshop crawl is somewhere I'd also visited on my first crawl. However at the time of my 2013 visit G Heywood Hill was undergoing building works and so I decided it was only fair I make a return trip before writing. Not that I'd been able to notice anything wrong during that first visit, but if a bookseller tells me they're not quite straight I'll accept them at their word (as far as I'm concerned, any excuse to visit a bookshop is a good one). Returning, I was able to understand the bookseller's concern. I'd loved my previous experience of books so tightly packed it was difficult to move, but now the shop is restored to its traditional two floors there is more room to breathe. There's also the opportunity to appreciate your surroundings: gorgeous fitted shelves and sturdy wooden tables that conjure up the idea of a Georgian gentleman's library. Move to the back of the room and striking red shelves surround, giving a startling alternative to the front. This is where the booksellers hang out, at sturdy, book-laden desks. In contrast, the children's section downstairs is simple and light. Having been closed on my first visit I'm unable to identify the result of the work, but simply found myself in a nicely appointed room where children can safely roam (and read) while the grown-ups lose themselves among the books above. From classics to modern fiction, they certainly have a lot to enjoy. The limited size of this bookshop may not need long to take in, but the traditional details and many and varied books require hours to appreciate. Whether you feel the romance or not you'd be hard-pressed not to fall in love with what you see, but telling you my experience here is only half the story, because the appeal of Heywood Hill is also in the history of the place itself. 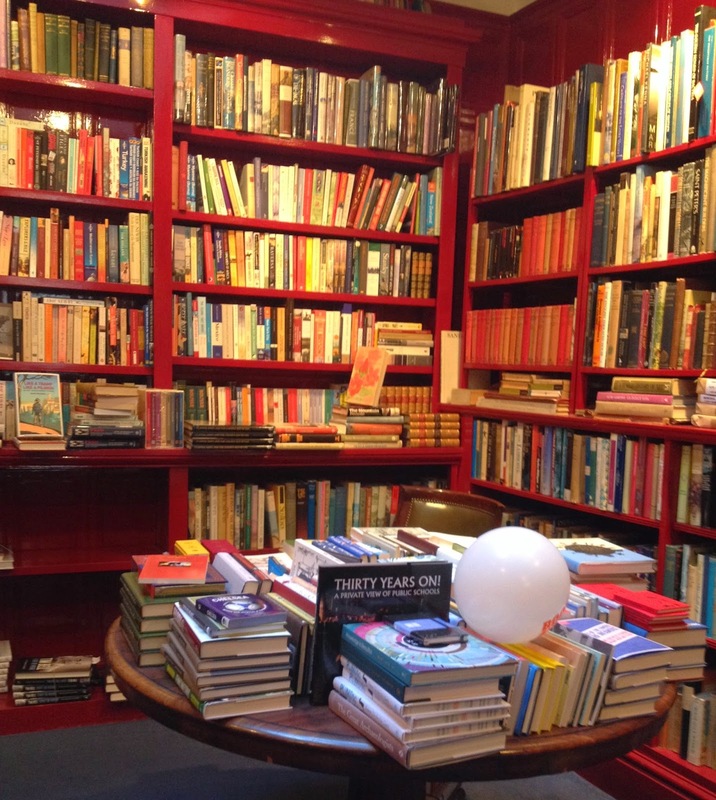 Found just off the beaten path on Curzon Street in Mayfair, the bookshop has had its fair share of fascinating visitors, not forgetting staff such as Nancy Mitford, who worked there during the Second World War. Indeed, reading the website or (even better) talking to the staff during a visit reveals a wealth of stories, and while I can't comment on the fame of present-day booksellers they certainly deserve their reputations as book-lovers. And I certainly recommend having a chat. Offering book advice and library building (including new, secondhand and antiquarian) among their services, visitors to Heywood Hill know they're in good hands. The bookshop even has a selection of A Year In Books options, where 12 specially-selected, brown paper-wrapped books arrive in the post. Surely the perfect gift for any reader? I could praise the services and the beauty of the bookshop all night, but as we've all got books to get back to I'll instead tell you I picked up classic books to complement my memory of this classic bookshop: Susan Coolidge's What Katy Did came home on this visit, while Erskine Childers' The Riddle of the Sands has now sat on my blog bookshelf for a year. Perhaps not the most obvious of bookshelf-fellows but great additions to my collection and mementoes of my visits to this rare and unusual bookshop. As traditional as they come in one sense but modern and welcoming to all in another, I hadn't arrived looking for the romance promised by my guide book, but that didn't stop me from falling in love. 10 Curzon Street, Mayfair, London, W1J 5HH.